Boulevard Dodge Chrysler Jeep is your tire centre in the heart of Montréal! 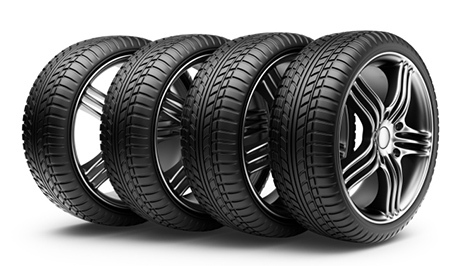 We have all the major tire brands in stock, and our specialists are always ready to help you with the maintenance or purchase of the right tires for your car, truck or pickup, according to your needs. We also offer our storing service at competitive prices. Over-inflation also increases tire wear in the centre portion of the tread and exposes your tires to damage from objects on the road and potholes. Your ride won't be nearly as comfortable either because your tires are 'bouncing' on the road. Now you have the opposite situation and too much of your tire is in contact with the road. This makes your tire hot and may result in overheating. In the worst-case scenario, this may cause tire failure. Under-inflation also increases tire wear on the tread at the edges and decreases your fuel economy. Your recommended tire pressure is printed on a sticker in your glove compartment, door jamb or fuel-filler door. This is the ideal pressure for the tires when used on your specific model vehicle. Note: The pressure on the tire wall is the maximum allowable air pressure, not the recommended pressure. Make sure to check your tire pressure once a month. At the same time inspect your tires for uneven or unusual wear. When we think of tire maintenance, usually the first thing that comes to mind is tire pressure. It's no secret that properly inflated tires last longer and optimize fuel economy. In fact, for every one pound per square inch (psi) below the recommended pressure, your fuel economy decreases by 0.4 percent. For example, if your tires are five psi low (which is not uncommon), your fuel economy will decrease two percent. You should get into the habit of checking the pressure in your tires at least once a month, or whenever you experience ambient temperature extremes. Air contracts when it cools, so a quick cold snap could leave your tires underinflated. Always refer to the tire decal on the door jamb for the minimum load pressure and tire size information. Refer to the tire sidewall for maximum load pressure. Remember that the tire pressure recommendation is for an ambient temperature or 'cold' tire. Therefore, tire pressure should be checked when the vehicle's tires are 'cold', not after extensive driving. Tires heat up after extensive use and with this heat, comes increased pressure. Keep a tire gauge in your car or truck so you can quickly check tire pressure any time. After checking the tire pressure, visually inspect the tires. Look for any abnormal wear patterns, A, that might indicate an alignment problem, such as a worn outer edge of a front tire. If the tread is looking a little thin, check the tread depth. Thank you again! Very satisfied with my purchase.